Lot Detail - Brett Hull's 1991-92 St. Louis Blues Game-Issued Alternate Captain's Jersey with His Signed LOA - 75th Patch! - 25th Anniversary Patch! 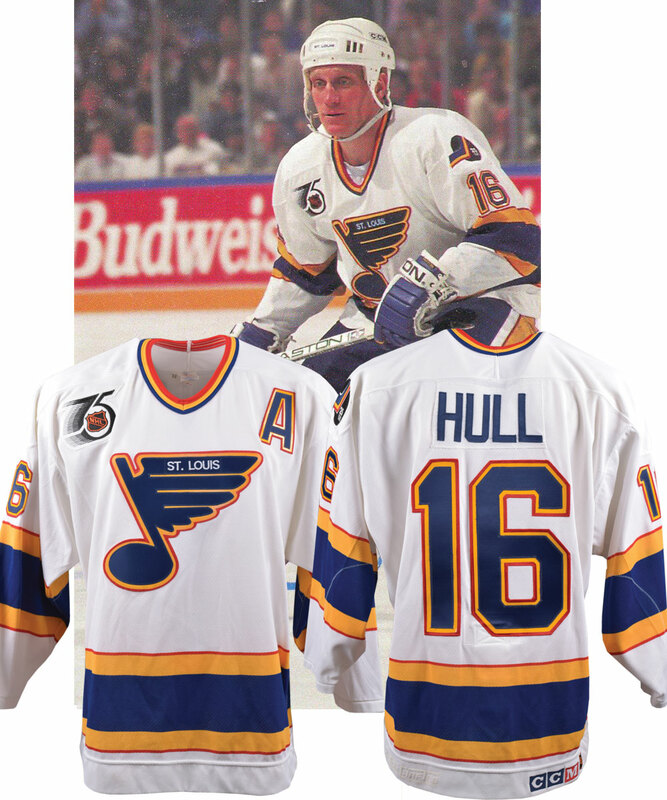 Brett Hull's 1991-92 St. Louis Blues Game-Issued Alternate Captain's Jersey with His Signed LOA - 75th Patch! - 25th Anniversary Patch! Another banner season for the superstar, Brett Hull would score an especially impressive 70 goals during the 1991-92 campaign despite missing 7 games late in the season, with this his third highest single-season total behind 1989-90 (72 goals) and 1990-91 (86 goals – the third-highest total in history). 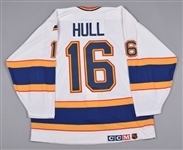 We have a St Louis Blues alternate captain’s jersey that was issued to the HOFer for the 1991-92 NHL season. A Maska Airknit label with affixed dated sticker (1/92) and size “52” fly tag grace the collar, with embroidered CCM and NHL crests over the reverse bottom hem near a white Custom Crafted logo. Featuring an attractive Blues team crest with “St Louis” embroidered on, “16” appears over the sleeves and verso, with the NHL 75th anniversary crest beneath the right shoulder and Blues’ 25 years crest over the left shoulder. The fight strap remains intact, with the team patch denoting the garment as a “3rd Set” example placed nearby.